Even in his schooldays, John Watson was an entertainer: one of his earliest memories is making a papier-mache set of Punch & Judy figures which in due course led to a Christmas show in the School gym. Sadly, his voice broke before he could realise his ambition to appear in a Gilbert & Sullivan production and after five years he left King James's to pursue his interest in Graphic Design. This led to studies at the Royal College of Art in London where, by a happy coincidence, a musical outfit calling themselves The Temperance Seven found themselves short of a banjo player and enlisted John to fill the vacancy. Within a couple of years, The Temperance Seven hit the jackpot when their recording of You're Driving Me Crazy shot to the top of the UK hit parade, closely followed by Pasadena. Today, John is still a busy banjo player and entertainer with Bill Posters Will Be Band, offering 'a complete musical variety show suitable for a wide range of functions', and he also continues his graphic design activities. 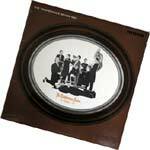 'You're Driving me Crazy' and 'Pasadena' available on The Very Best of the Temperance Seven (Goodmusic.co.uk).